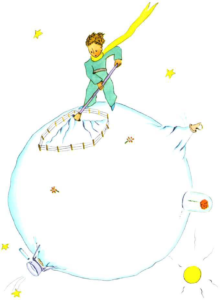 “It isn’t good to listen to the flower,” the little prince tells me one day. “Never listen to flowers. You have to only look at them and smell them. My flower makes my planet beautiful. She smells so good. But I don’t know how to like her. The story about the tigers makes me so angry. But it isn’t good to take it so seriously. It is good to love the flower because she is so beautiful and she smells so good. 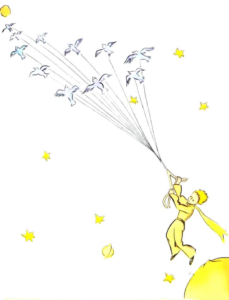 I believe that when the little prince leaves his planet, wild birds help him. On the morning of his departure, he prepares everything. He cleans his active volcanoes. There are two active volcanoes on his planet. They are very good when he needs to cook his breakfast in the morning. He also has one volcano which isn’t active. But, he says, “You never know!” So he cleans this volcano too. If the volcanoes are correctly cleaned, there are no eruptions. Of course, on Earth people are very small. They can’t clean volcanoes. And because people don’t clean them, the volcanoes can be a big problem. Before his departure, the little prince also pulls the last little baobabs. He thinks that this is his last day on his planet. He doesn’t plan to come back. He gives water to his flower. Then he brings the glass. At that moment, he wants to cry. “Goodbye,” he says to the flower. But she doesn’t answer him. “Goodbye,” he says again. The flower coughs. But it is not because she is ill. The little prince is surprised that the flower is sorry. He doesn’t understand why the flower is nice to him. “I have to be stronger than two or three caterpillars if I want to see the butterflies. I think that they are very beautiful. If there are no butterflies here, who can visit me when you are so far? And I am not scared of big animals. I have my thorns.” And she shows all of her four thorns to the little prince. She says it because she doesn’t want to show her tears. She is a very proud flower.